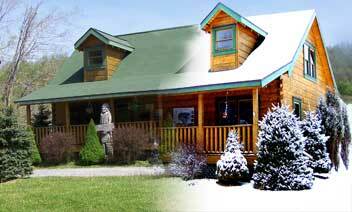 Located at the base of Snowshoe Mountain, near The Snowshoe Inn, we are a log cabin with purple trim! If you have multiple guests coming at different times please advise our office so we can leave the correct number of maps! GPS does not work well in our area due to living in a “National Quiet Zone” so we like to help navigate our guest to their properties! Pre Route to our office! Bring a hard copy or screenshot your directions! You will lose cell phone service the closer you get to Snowshoe Mountain. AT&T does provide cell phone service in the central Village. Outside of the Village, spotty at best. Again this is due to us neighboring a Radio Observatory in a “National Quiet Zone”. You will however have a landline in your unit so make sure to pass it out to friends, family and other guests in your party, as well as our number, 304-572-2210. The back country roads surrounding the resort are some of the most scenic in West Virginia. When planning your drive be sure to give yourself plenty of time to enjoy the many scenic vistas and historic sites in our Wild and Wonderful Mountain State. 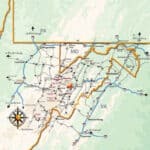 Mountain Valley Realty is conveniently located on Rt. 66 in the Log Cabin with purple trim. Between Big Spring Clinic and The Inn at Snowshoe.